About ~ Celestial Body, Inc.
Ann Harmon is a certified Aromatherapist, Massage Therapist and Herbalist. She was Missouri director for NAHA [National Association for Holistic Aromatherapists] from 1997 –2002. Teaching Aromatherapy and Herbal classes since 1999. 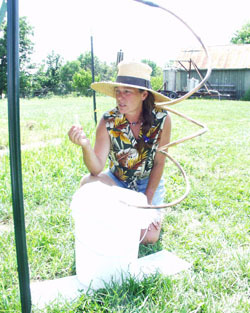 She has been a project steward for the Aromatic Plant Project from 1996 to present. Ann has had article published in Scentsitivity, Aromatherapy Journal and the Aromatic Plant Project newsletter. Ann and husband Wayne created Starr Pines Christmas Tree Farm in 1986 and Celestial Body Aromatherapy in 1995. They wild craft and organically grow therapeutic aromatic plants that are steam distilled into Hydrosols, and then used to create their all natural skin care products. They also raise honey bees. Ann is a member of the Missouri Christmas Tree Growers Association and The Missouri Bee Keepers Association. Their shop Celestial Body Natural Arts was opened in Boonville in 1995. To learn more about our farm, Starr Pines, please visit StarrPines.com.